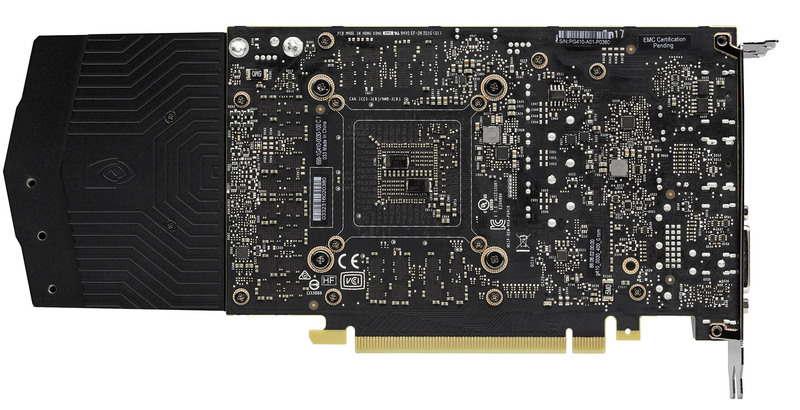 Measuring 240mm long and taking up the usual dual-slot form factor, the GTX 1060's cooling has similar industrial design to the bevy of reference cards that have gone before. This GPU's cooling apparatus misses out on the Perspex cover over the central section. There's little reason why this card couldn't be made into a Mini ITX form factor, should an AIC spend a little time and money on development. 6GB of GDDR5 memory, rated at 8Gbps, surrounds the mainstream Pascal core on the other side. There's no official word on models equipped with 3GB of memory, ostensibly to combat the Radeon RX 480 4GB card that comes in at a $199 base price. A side-on shot shows the single 6-pin power connector on the right. By employing a short PCB and using a reference cooler, Nvidia is seemingly forced to push the power connector to the end. Notice the lack of SLI connector on the left-hand side? Nvidia, though, keeps design continuity by having the logo light up. Here's a better view of how the Founders Edition card is constructed. 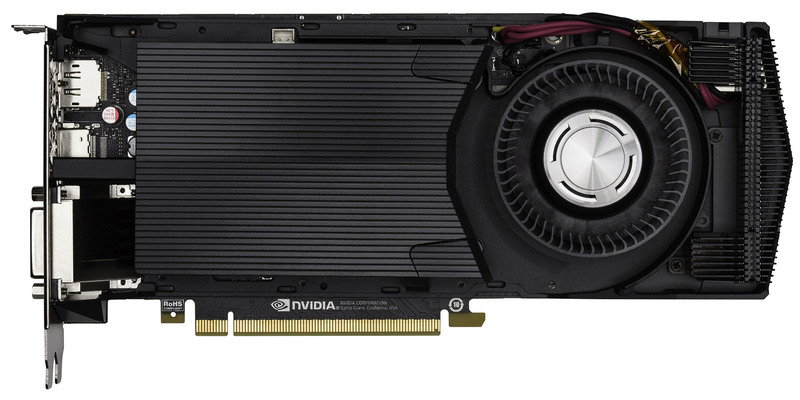 Nvidia has spent significant resource in building the reference cooler that remains an attractive design, albeit not as effective at getting rid of heat as AIC cards. Keeping such a cooler on the short-PCB GTX 1060 means that the six-pin connector is hooked up to the board via wiring, rather than being soldered straight on to it. It's not an elegant approach and may well have ramifications for board partners who don't want to fully redesign their PCBs for custom coolers. Hello, shorty. There's been fervent discussion as to whether the GP106 Pascal die supports more than what Nvidia is letting on. Notice the two empty memory spaces on top of the chip? 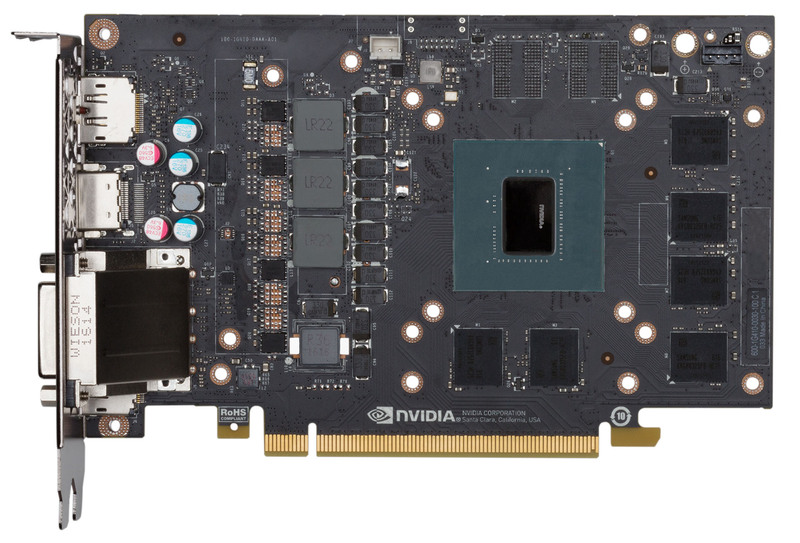 If Nvidia was to use the same memory it would result in an 8GB card most likely connecting to the GPU via a dormant 64-bit bus, enabling the GTX 1060+ access to more bandwidth. Such talk is merely wistful conjecture at this point. All current GeForce GTX 1060 GPUs - Founders Edition or otherwise - have an active 192-bit memory bus. Nvidia usually keeps the same display outputs across an entire generation of GPUs. The GTX 1060 is no different in this regard, packing in a trio of DisplayPort 1.4, HDMI 2.0b and dual-link DVI. 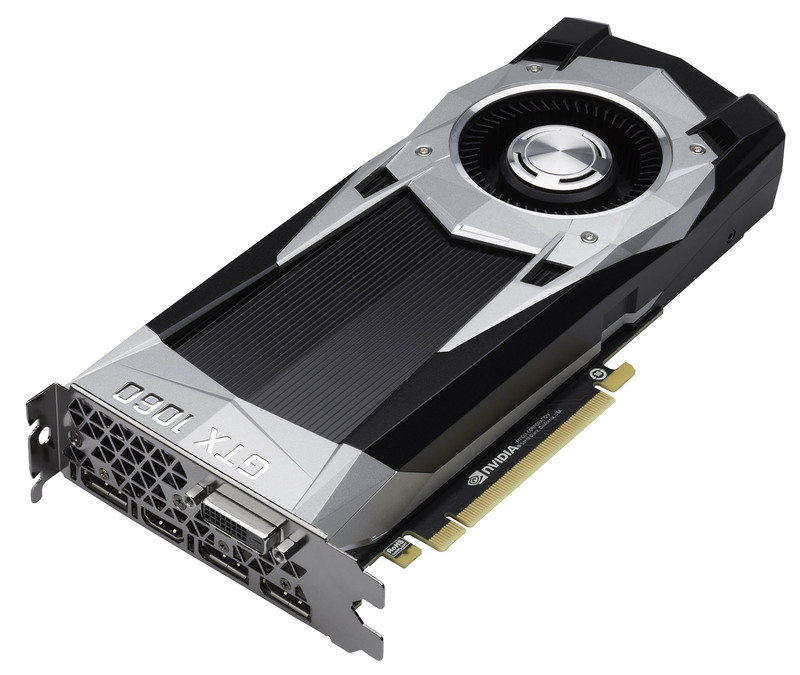 And given that the green team is focussed on pushing the qualities of the Pascal architecture's virtual reality credentials, it appears as if this GPU, like GTX 1070 and GTX 1080, may have initial problems connecting to a VR headset via DisplayPort. The Founders Edition card sticks to the design philosophy laid down by successive reference models. It's a good-looking piece of kit that, at $299, has a $50 premium over the cheapest GTX 1060 cards. Nvidia sets the frequencies conservatively, too, at 1,708MHz boost and 8,000MHz memory, so would-be purchasers of the FE card are more enamoured by looks and build than the best bang for their buck. Before we run off to the benchmarks, it is worth repeating that this card is only available from Nvidia.com - and it's the first mass-produced GeForce to be sold in this manner. A harbinger of things to come?